Update to Artifact Provision Cost! We’ve just released an update which changes the provision costs for some cards, mostly Artifacts. You’ll find a list of cards which received the change below. These cards will have full mill value (scraps only) until November 12th, 2018 10:00AM CET. Based on statistics, Artifacts have been been too dominant in the current meta, specifically Sihil, Mastercrafted Spear and Thunderbolt Potion. This popularity of Artifacts caused players to include Artifact removal in their decks. The problem with that was there were simply too many Artifacts, and not enough possible Artifact removals to make a truly feasible deck. It was never the intention to enable decks based solely on Artifacts. After weighing all pros and cons, our design team decided to raise the provision cost on Artifacts cards to decrease their number in decks. Also, cards like Zoltan: Scoundrel and Golden Froth have received higher provision costs. These cards together gave very high row buffs on stacked rows and could be a potential issue later on as the metagame develops. Note: You won’t have to download an update, changes are done on the server side. This is just the first step and a small hotfix for the most pressing issues. We plan to release an update in December focusing on further balancing the game, as well as bugfixing. Clap, just clap, love u CDPR. Artifacts were mostly only dominating in an (Eithé) Control deck. This change also affects other decks that only use a few of the artifacts for support. Also, Summoning Circle, Black Blood and Ale of Ancestors didn't need to change, in my opinion. 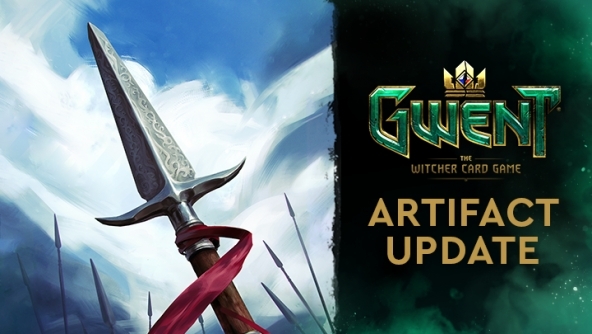 I do hope CDPR will revisit the artifact nerf and provide a more interesting solution, like introducing the equip ability. Hallelujah, hail Mary and AMEN! Looks like fun is back on the menu boys! Nice step, what about Gremist though? Well, better late then never. 3 out of 4 games I had yesterday were against Eithne control. Witcher Trio is balanced, though. No need to adjustment there. Sarcasm is strong in this one! But seriously, 12 str for 21 provisions and 3 cards! Barely any deck would want to have those! You can't even eat one with a ghoul so it's a 14 points bronze card! Also, Summoning Circle, Black Blood and Ale of Ancestors didn't need to change, in my opinion. I wonder why Pitfall Trap was included in this? Please consider a different change for Sihil. It's a HUGE deal in Arena. Otherwise I'd say mostly fair changes for now. Mostly a needed change. There's definitely cards that need to be looked at, at the very least their provision costs, but it's surprising that the Witchers are still as they were. These laughably cheap cards that give a good burst and thin your deck now that doing so is no longer as easy as in the past... Nah, it's coincidental they're everywhere. Artifact removal costs 1-2 provisions? Each time, you're trading down by 6-14p; Caretaker trades down by 8p. You now have to play 8 cards for Shield/Spear/Ale to break even; need a target. Those were some of the only proactive measure to keep engines alive. Consider the alternatives: Botchling (no zeal, dies to removal), Sergeants (get removed), Nenneke (row-locked, no zeal, just gets locked/moved), Dandelion (puts your key units in binary removal range, and is bad in short round), Vysogota (removed, row-locked), and Anna (conditional, requires previous proactive buff, damage kills the engine). Unbelievable but Arena might be even worse than before. You no longer need to pray for a Shupe since there's usually no way to remove artifacts. You'll just get destroyed by Sihil and Caretaker like in my second Arena game. Because it can be a win con when you do not have CA in the final round, knowing that the opponent probably saves his strongest unit for last, which is usually the best time to play Pitfall Trap. Yes, I agree. Using buff artifacts to keep engines alive was already balanced, which is now unfairly nerfed because of the Artifact Control dominance.